could you please make a widescreen version ? As I've stated before, I love this theme.Could you make another one like this which is business orientated? This will be my first theme for Aston! Love the clean smooth look, I will try add some plugins to see if they work together. Super!!! Davno jdal Chernuyu temu! I like the clean look, LQQKS very nice. I do not care much for the start up menus on most of these ashtons tho. Wish it was more like vista or the original xp. My system freezes up almost everytime I clcik on any folder. especially the documents folder and pc crashes. But a 1024 x 768 would be nice for me! Can you make it? I am running 1 gb of ram, is this sufficient enought to run this desktop theme? My pc freezes up when I click on the doc plug in. every time. This theme is awesome!! could you please make it for 1024x768?? My pc was freezing up then crashing shortly after installing the Dark Reflection Theme. I was certain it was the theme but was mistaken as it was the vista icon i had downloaded to my pc months previously. I removed the vista icons and replaced them back with the Xp default iocns and everything is running so much smoother. I was just so disappointed in not being able to use this great slick LQQking theme. And came her posting my problem in hopes of finding a sloution, I never gave up and found what it was. 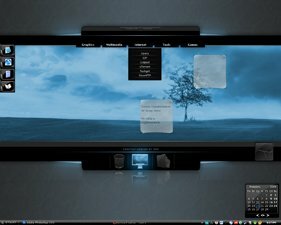 I am just glad and very happy to have such an elgant theme for my Xp OS. Is there anyway I can further tweak this theme? I would rather not have so many folder options open up in the start menu. I actually like the xp startup menu setup or vista's. Anyone else have serious spyware/maleware problems after download flasheget and the bat.exe which is an email client. this one here was a lil f**** to get romoved Ekvgsnw Toolbar . Here is something to consider I did a few tweaks from this tutorial. The shutdown dialog box sorta matches this black reflection theme, looks good. This is the order I did everything in. I first downloaded the Ashton black reflection theme and installed that. Then downloaded and saved this file and open it. This file has the vista icon files in it, the file is VIP3 just click and run it. The first time I did all this I loaded the vista like icons first than the black relfection theme and whenever I clicked on a folder on blk reflection it would freeze. And when ever I rebooted I got this one particuliar popup but like I said, after I loaded the blk reflection theme first then the VIP3 vista icon file it fixed this problem. Everything is running smooth and looks very good with these added feature tweaks. This is the vista icon file the file called VIP3 is in it. So, to save alot of trouble, have the theme loaded and installed before installing the VIP3. You will need this utility tool to apply the following changes. You do not need this tool for the vip3 file. And here is a download for like 25 different vista themes for xp. Download it and look for a theme called Luna (Longhorn Revolution)it will change how the browser looks in internet explorer. Matches the blk reflection theme well. It's easy to make 1024*768 without skinning at all. 1. Drag'n'drop all the stuff into 1024*768 rectangle. 2. Change screen resolution to 1024*768. 4. Align empty desktop elements (marble panes and black backgrounds for icons and Panel) according to your taste. I'm sure that different people would get almost the same result :) . 5. Align icons and plugins. For other resolutions beg the author to make. Laszcz how do i do to "Drag n´drop all the stuff into 1024*768 rectangle". I mean what do i need, what propram. Holding SHIFT key you can Drag n?drop locked elements. You need noany program. The "stuff" is icons , plugins and decorative Theme's elements. Anyone know if there is a version 1024 * 768? Or if there would be a next version with 1024 * 768? I use a 4:3 format screen, this is not quite central, but great on the wide screen laptop. Thanks for a nice theme. REALLY AWESOME!! It would be nice if you could do an winamp skin too! This is the closest winamp skin I could find to match the colors of black reflection. I station the winamp att he top just above the POWER OFF/RESTART plugins. I also collapse the winamp. fits nicels up there out of the way as well as blending in very well with the theme. Mmmm looks goooooooood on my screen!! I have been having alot of trouble opening my documents up. I use my documents alot and it freezes my system up whenever i try to open it. somtimes it works fine for awhile other times it locks everything up. I have 3 GB of ram. What is causing this? Are the plugins not working properly? I lose constantly the wallpaper of this theme. Is it possible to become the wallpaper separate? absolutely amazing theme, i usually dont comment on themes as i find one and stick with it, but this sets the bar when it comes to practicality and appearance. Firefox has an excellent browser them to go along with this desktop theme it can be found under 'modern' name of theme is Black Aquatint. also look for my winamo link above, it goes well with theme too! one of the best themes I've ever seen. That theme is looking great at night in my dark room! Anyone who wants to make this theme fit their screen resolution is change these image sizes in PSP or even in Paint. Background image just change the width. Not the hiegth. Change the bottom_panel and the top_panel image. Again just change the width. the rest are plugins which you right mouse click on and change the x - y to fit back into their corresponding places. to find the folder where these images are just right mouse click on the desktop and choose aston options and click on the drop down which say's Desktop and and right mouse click on one of the images in the pane. Should be able to figure it out from there. Make sure u save your images as png. Love the Theme and very friendly when you have everything in its place. I was wondering if you or anyone can suggest a Hard Drives plug-in that looks good and actually works with all the Disk info, monitoring and lettering. Also any USB external drives? maby you could make the theme for 1600 res also..
and will do so for a long time. All u need to do to change it so it fits the resolution of your monitor is look for these three images. I found them here. Guys, I am a complete bofon, when it comes to changing or modyfying stuff like this. I have tried changing the 3 files mentioned above, but the rest of the elements do not fit (eg the middle drop down menues and the shutdown restard etc. I need to change to 1024x768, as my laptop cannot display a higher resolution. What I really need is someone to document how to do all mods, for all elements please. Best is someone who has the knowledge to maybe help the many here who are asking for 1024x768 and provide a download link. But I am happy to try if I have better instructions please. Guys, [please] it's almost a month and no one can help ... ?? Can someone help me to fit it to my 1024x768 laptop. how to instal archive atz? to make it fit your specific resolution find the three images i posted above. Change the width to your screen resolution width. Need to find a software that can change the size of an image like corel psp adobe , paint might even work. replace theorginal images with the new rized one's. How hard is that? I love this theme. thanks to the designer. how to use atz file in windows XP. Really like this theme. Well done. I have modified it to fit my 1400x900 screen and changed it up a bit. Have a couple questions though. 1. When I save theme it wont save the bottom and top backgrounds to new theme file. Wondering if you could help. 2. Once I get theme working, was wondering if I could post it. Will be happy to send it to you first if you like so you can check it out. Thought I'd let everyone know I have uploaded a 1440x900 version of this theme to Deviant Art website. made quite a few changes to it so it's not quite the same as this original but I hope maybe some of you will still like it. 1) Converted to fit 1440x900 screen. 2) Converted theme to black/grey color scheme. 3) Added Amonitor Plugin (moded to blend with theme). 4) Added WinAmp Plugin (modded to blend with theme). 5) Changed Power/Restart buttons to link to a utility which allows skinning of Shutdown dialogue window (Utility and install instructions included in zip). 6) Changed wallpaper (don't know artist. will give credit if find out name). 7) Changed programs listed on left side panel. 8) Changed Trash, My Computer & My Documents icons. Think that about covers it. Like I said, be happy to give credit where credit due. Just let me know. Below is link to theme at Deviant Art. I just posted a matching MSStyle for this theme at DeviantArt. Use it to get your open windows to match this theme in Aston. Not suitable as a a standalone style as I didn't bother to worry about skinning the taskbar, startmenu, etc..
Our team will review it soon. We thank you for your time and contribution. I made a pastel colored version in 1440x900 and 1280x1024 also. Can download the 1440x900 version from DeviantArt at web address below. Submitted updated versions of my modified versions of this theme to DeviantArt. You can visit my Gallery to see them using address below. If anyone views this who knows RiM, let him know about these and have him check them out. If he doesn't approve, I will remove them if he wishes. RIM Would you mind if I posted this desktop theme on WinCustomize so other's can use it as a DeskTopX theme? If so, plz send me an email stating you give me permission to do so? How to open the file without buy the ashton software. If there is a simply way to do it, I would appreciate it.